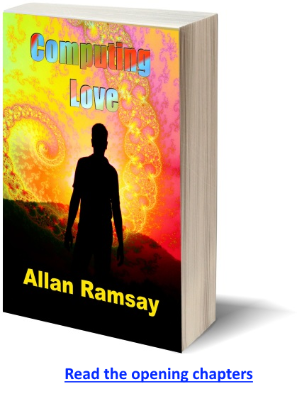 ​Computing Love is a visionary novel inspired by A Course in Miracles. It tells the story of a scientist, Kyle Williams, who is transformed by visitations and guidance from two spiritual mentors. They invade his dreams, his home and his life, then set him on a path he cannot understand, declaring life itself is an illusion. They send Kyle on a journey so incredible it forces him to question everything he ever thought he knew, including the very meaning of life and humanity's place in the universe. ​He and his team struggle against forces that want to condemn his work to the ash bin of science, even as Kyle strives to learn how he might “reboot” the mind of humanity and bring suffering, poverty and misery to an end. ​​It's the year 2032. Physicist and computer scientist Kyle Williams discovers a technology that will birth the world's first quantum super computer; one that utilizes the entire Internet as its foundation and solves problems that have plagued mankind for centuries. He barely gets started when a blood-curdling nightmare pushes him to the edge of death. He awakens in darkness to find two characters from his nightmare have invaded his home—a man and a woman who claim to be spiritual mentors bent on helping him. They send him on a mission even more extraordinary than the bizarre world of quantum computing. It's an exploration that can reveal ancient secrets from before time began, and can bring mankind to eternal joy, peace and Love. If he fails, the unholy trinity of sin, guilt and fear will rule the world, promising only illusion, misery and death. This is a story of discovering what Love truly is and learning to remove the blocks we erect against it—a story that re-defines how life can be lived. If you're a follower of A Course in Miracles, this is for you. If you enjoy romance, tech, computers or sci-fi, it's for you too.